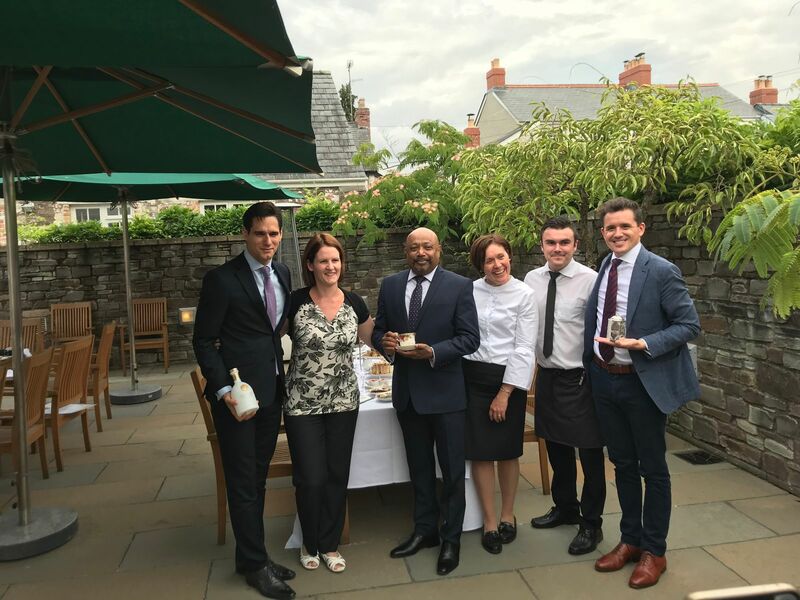 We had an invite to attend a high tea at Abergavenny’s most renowned hotel, The Angel Hotel recently. 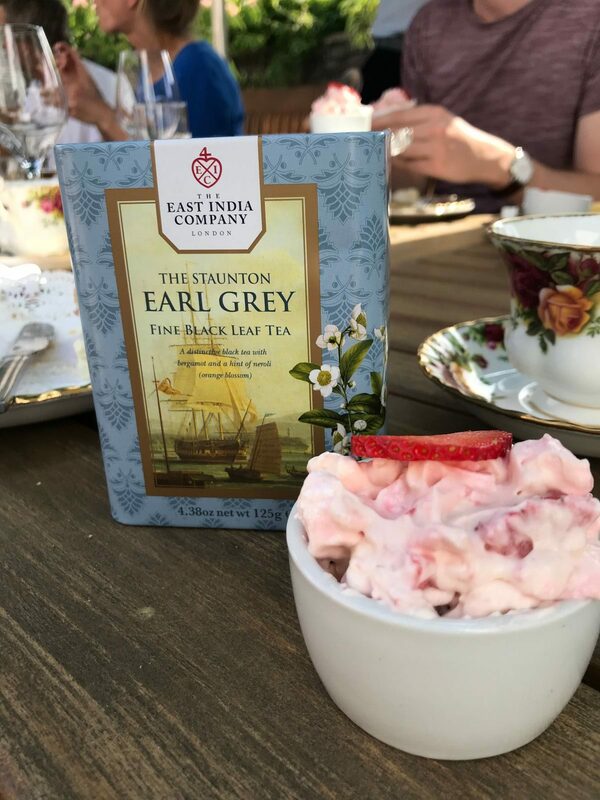 Now normally I would have been just a little bit excited, but when I found out it was in collaboration with The East India Company I can’t repeat what words left my mouth. Not only celebrating some of the their finest teas but also a chance to try some of the cocktails knocked up by their resident mixologist with one of my favourite gins, The East India Company’s own juniper laced spirit. If you’d asked me a few months back who The East India Company were, I probably wouldn’t have known much. But seeing that I’d included the gin in a gin and Indian food pairing tasting menu with a recent collaboration I’d done between Cardiff Gin Club and Purple Poppadom in Cardiff, I could probably recite the 400 year history off the top of my head after my research into the company. I’ve always fancied staying at the Angel Hotel but never had the chance and heard the afternoon tea was the best in town. I did spend a couple of weekends in the town when they were hosting the National Eisteddfod about two years ago and I decided to treat the other half to breakfast there for her birthday. The fry up was very good and went down even better with the smoked vodka Bloody Mary I’d swapped the cuppa for. I’ve always driven to Abergavenny when visiting and hadn’t ever occurred to me about catching the train, but it’s not much more than 30 minutes with no changes from Cardiff Central for less than £15. Knowing that The East India Company were travelling down from London with a bag of their finest gin and expertly paired cocktail spiking liquids, I think leaving the car at home was a wise decision. Luckily for us the usual crappy Welsh weather had been on our side and the plans of having the high tea out on the terrace, in the sun were still going ahead. I’d even given the scalp a slather of 8 hour sun tan lotion just in case too before I left the house. All the guests were seated together on a long garden table with a canopy flared out to save those who hadn’t taken precautions with the factor 15 from blistering in the glorious sunshine, which I’ve found hard to grow used to lately. To wet our appetite before the festivities commenced, we were served a round of Welsh 75 cocktails. A play on the delicious French 75, which is usually a concoction of gin, fresh lemon juice, Champagne and a dash sugar syrup. This Welshified 75 had the addition of cassis to give it a shimmer of red. 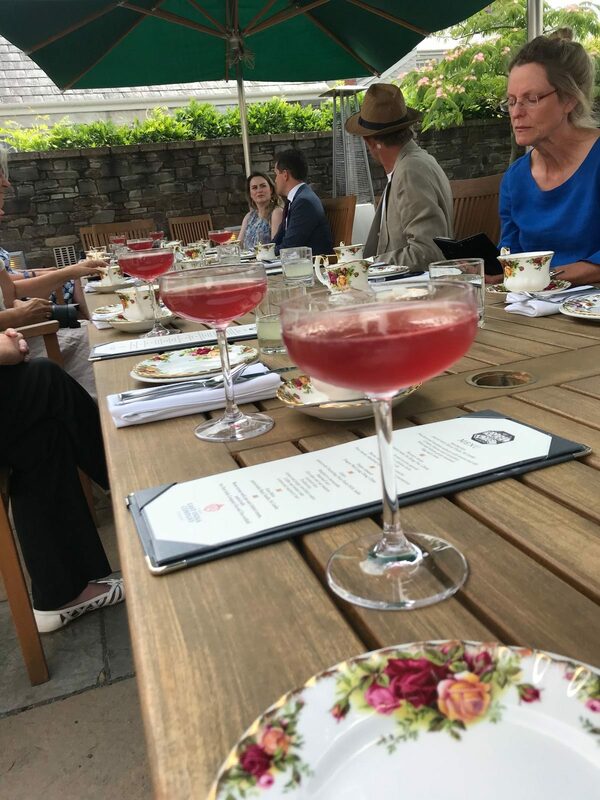 Whilst we sat sipping the amalgamation of sweet, tart and dry flavours from the cocktail, we were introduced to the team behind The Angel Hotel and The East India Company representatives who specialised in fine teas and of course my favourite tipple, gin. 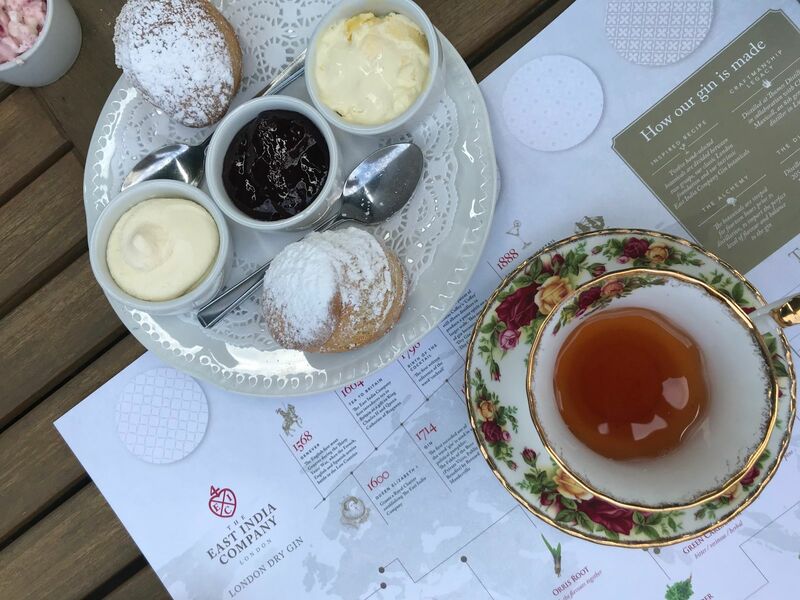 Each course or plate of food brought out for the high tea was skilfully paired with fine and rare teas sourced from around the world, whilst being curated by The East India Company Tea Master about its history. I found this mesmerising hearing about someone who had worked in the tea industry for 30 years and who works directly with the tea planation owners after I’d read so much about tea, putting the gin pairing menu together recently. I’d sourced a Darjeeling Tea gin and created a tea syrup to go with the desert menu so the chance to have something put together by the experts in the trade was amazing. I also didn’t realise that The Angel Hotel was had been awarded the prestigious Tea Guild award for it’s quality, selection and knowledge of tea and is the only venue outside of London to receive such an honour. Onto the high tea / afternoon tea. I wasn’t quite sure what the difference between a high tea and an afternoon tea was to be honest. I thought high tea was a pot of tea with some scones, jam and cream and maybe a few little cakes then an afternoon tea was something a bit more substantial with sandwiches and a few more pastries thrown in. After doing a bit of research it seems it dates back over 100 years and was to do with the classes at the time. Afternoon tea was consumed around 2pm and was mainly indulged in by the upper classes as they didn’t have to work and it would keep them going until evening meal around 8pm. High tea was more of a working class meal around 6pm because they couldn’t afford the time, privilege or money to wallow in such luxuries in the afternoon when there was money to be made to feed hungry mouths at home. This would be the only meal they would have after midday so was a lot more substantial as they wouldn’t have an evening meal around 8pm like the more wealthier people of the time. First up was the sandwiches, comprising of triangles of poached salmon, with lemon and dill, cream cheese and cucumber, ham and whole grain mustard and finally egg and cress. The sandwiches were paired with The East India Company Royal Flush tea. A Sri Lankan tea which got it’s name from the original tea bush that was planted by Prince Philip in 1954 to commemorate Queen Elizabeth’s first state trip to Sri Lanka after Coronation. This was the only tea were recommended to taste with a little dash of milk. I’m not much of a coffee drinker, I’ll have the odd flat white on the weekend but I do love a good cup of tea and this was an excellent introduction to The East India Company Tea portfolio. 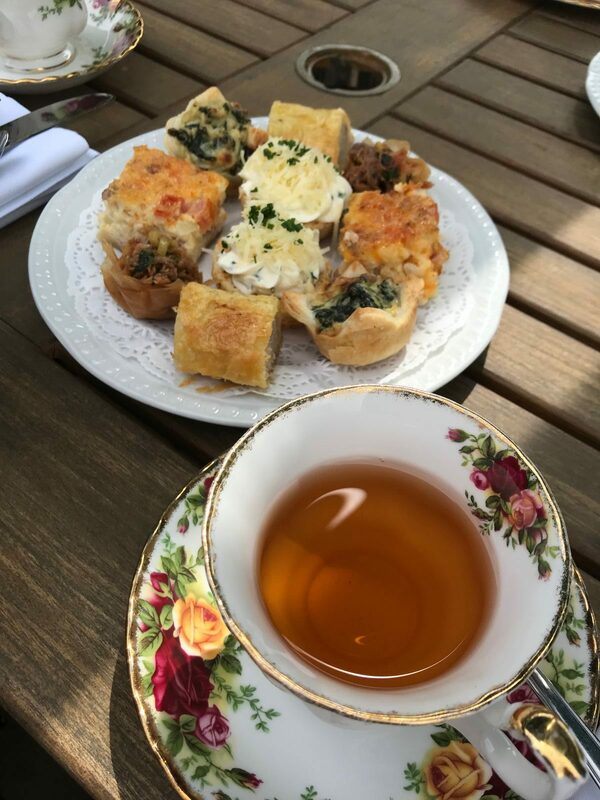 The savoury plate was next out, consisting of bite sized spinach and ricotta parcels, coronation chicken tarts, sausage rolls, bacon, onion and cheese quiche, feta cheese, sundried tomato and pesto parmieres. I savoured every last morsel of the savouries with each manageable bite whilst sipping a Chinese tea called Da Hong Pao, which was light, pleasant served without my usual splash of milk. After allowing the group to work their way through the savouries, have a chat amongst the group and being enlightened by the Tea Master (I know what a job right?) we had the chance to cleanse our palates with refreshing glass of Dragon Well Lung Ching. 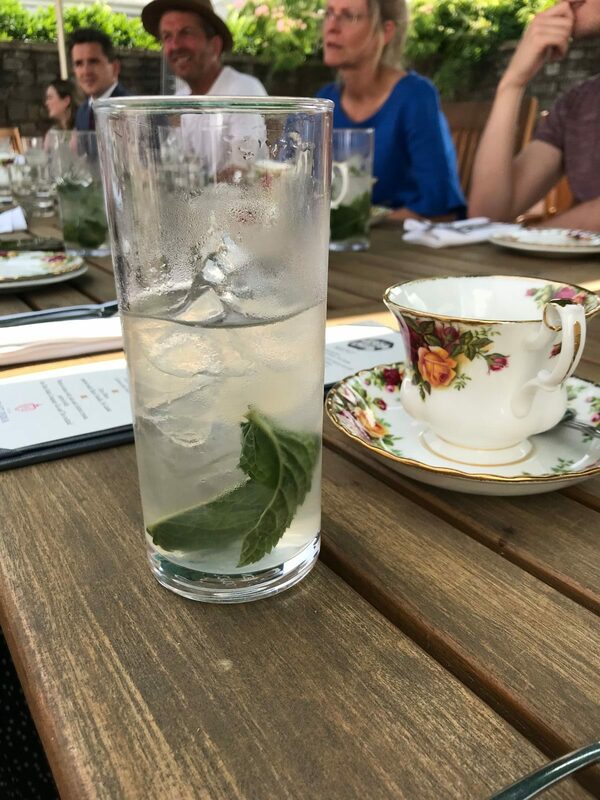 A green tea from China, served cold in a highball glass with a healthy serving of ice, mint and honey. This was divine and so well received after the walk from the train station in a pair of thick trousers in 25C heat and basking in the sun for the past hour or so in the terrace. It was so refreshing, but one couldn’t help wondering what a cheeky nip of gin would have done to liven it up a bit. 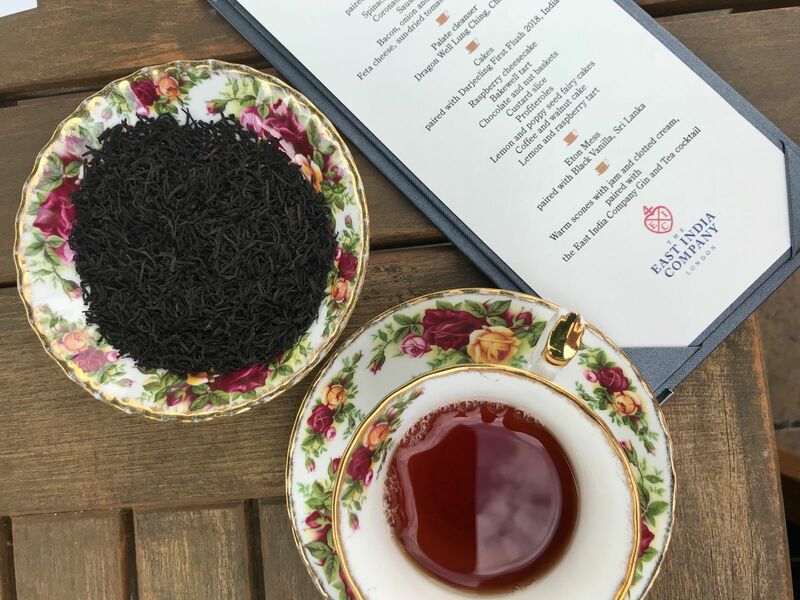 I was excited for the next course, not only because everything was saturated in sugar but it was my first chance to taste the Champagne of teas, the Darjeeling First Flush from India. I’d bought a bottle of Jindea Single Estate Darjeeling First Flush Gin to try pairing with the PP tasting menu and looked into making the Darjeeling Tea sugar syrup with first flush tea leaves until I saw the price of the tea. The Darjeeling First Flush, which is the first of the tea leaves picked between November and March is one of the most expensive teas in the world and probably the first and last time I’ll be able to try it. 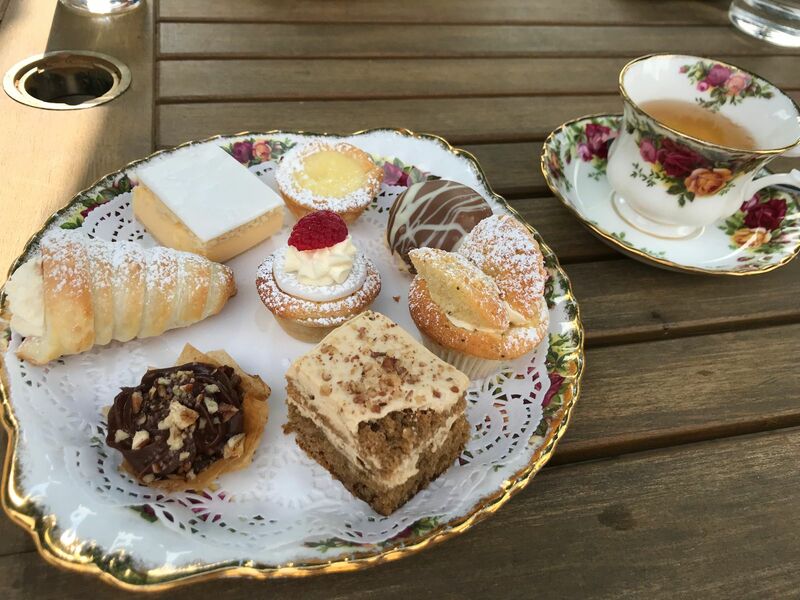 The tea was paired with raspberry cheesecake, bakewell tart, chocolate and nut baskets, custard slice, profiteroles, lemon and poppy seed fairy cakes, coffee and walnut cake and a lemon and raspberry tart. Yes I know, that’s one hell of a cake banquet for one person so we chose to share a plate between the two of us to save us from purchasing an extra seat each on the train journey home, especially as there were another two courses after this. Not only do they know their teas at The Angel, they don’t half know how to spoil you with the food and that rings true with the high tea too. I couldn’t fault any of the cakes but I just can’t imagine any mere mortal conquering the whole feast themselves, not that that’s a bad thing. I’m sure they would be happy to box anything up for the journey home once you’ve had a breather. Next we were served mini bowls of Eton Mess, one of my all-time favs and served with probably my favourite tea of the day the Black Vanilla from Sri Lanka, which bounced off the flavours of the Eton Mess really well. The meringues were spot on being soft and chewy on the inside. There’s nothing worse than biting into a meringue and it bursts into dust like one of those joke golf balls that explode when you whack them. If that wasn’t enough to put anyone in a food coma, the final hurdle was in the form of warm scones, clotted cream and jam. Obviously this nearly led to a few fisty cuffs over who was right and who was wrong regarding jam first or cream first. Having a whole host of people from across the pond gave me some security and re-assurance as cream obviously comes first with a generous dollop of jam, as the jam is easier to spread on top of cream than the other way around. We’ve nearly had a divorce many a time over this topic. 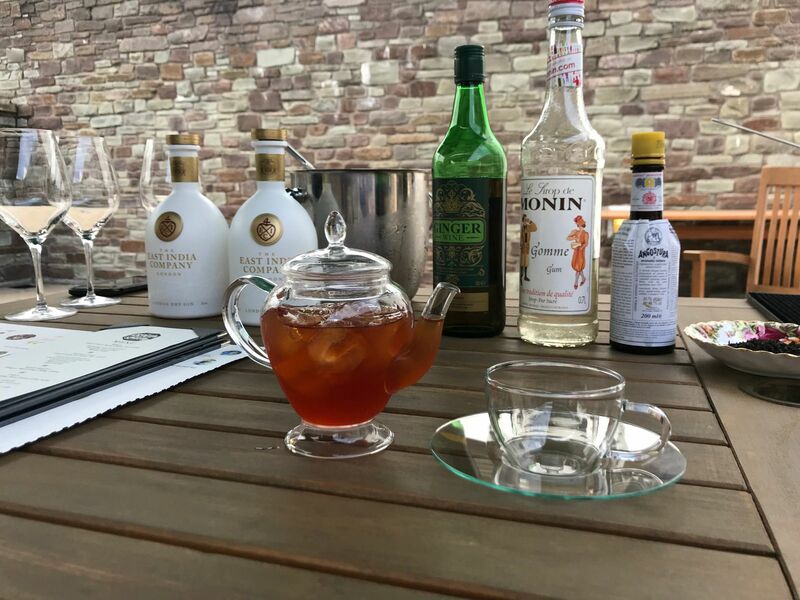 To finish off a sumptuous journey through the tropical climates of Sri Lanka, China and India paired with equally delicious food from The Angel Hotel Kitchen we were treated to a Gin Tea cocktail by The East India Company mixologist. I’ve been playing around with G & Tea’s a lot lately but had opted to infuse a sugar syrup so it was good to get an insight into how a fine tea importer servers theirs up. It was interesting to see they infused the gin with the Early Grey and add a sugar syrup later to sweeten it slightly, along with some ginger wine and a few dashes of the Angostura bitters. The original bitters that the East India Company soldiers mixed their gin from England with to create Pink Gin. The East India Company soldiers can also be held responsible for creating the quintessentially British drink, the G & T by mixing their gin brought over from Britain, a little bit of sugar, water together and using it to make their daily ration of quinine more palatable to fight off malaria. If I could pick the perfect day then sitting on a terrace in the sun, being served cocktails, the best tea you can buy, married perfectly with sweet treats and pastries would be right up there. I really couldn’t fault the experience and would highly recommend it. 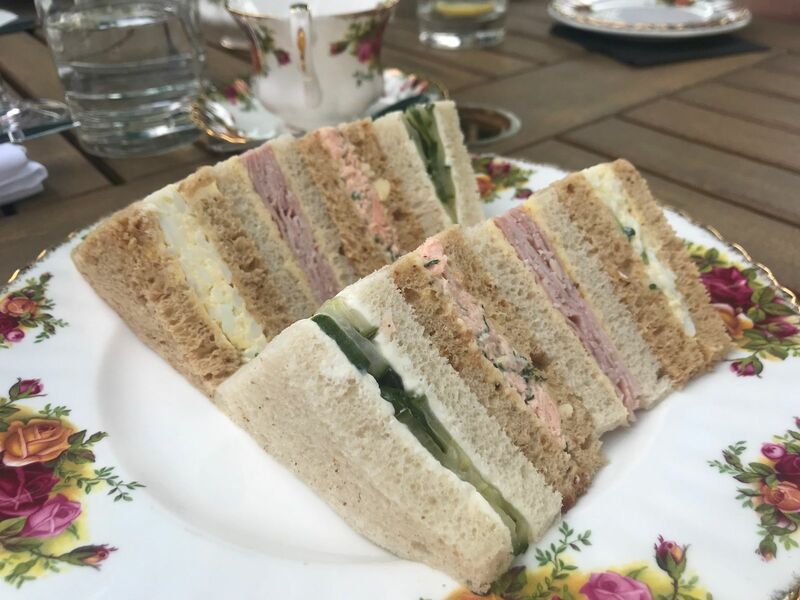 Normally an afternoon tea is all about the cakes, sandwiches and scones but it was such a welcome difference at The Angel Hotel because the tea takes centre stage along with the food. Normally when i’ve gone for afternoon tea, the tea is actually an afterthought and you’re just served a choice of tea from a small selection and you get a pot placed on the table to brew. You’re then stuck with that pot till the end of the service. I thought it was a excellent that they paired each plate of food with a different tea and really took us through a journey across different continents with their unique landscape that helps to impart it’s stamp on the tea leaves and it’s final taste. I’d like to thank the team at The Angel Hotel in Abergavenny and The East India Company for a truly unforgettable experience. One last note and that is Abergavenny Food Festival takes place over the weekend of 15th & 16th September in the town centre. I’m not sure what availability is like for staying the nights The Angel Hotel during the two day event that brings the very best craft food and drinks form around Wales and under the roof of the Indoor market and lining the town centre. I’m sure there will be plenty of room to swing by for a drink or two, breakfast ( which is pretty damn good) or some food in the Oak rooms though.